Those are the results from the tests of the Brain Trend Stope and Reverse expert on 5 m time frame. I show the history from september, I do so to show how the profitability changes from the beginning of october. For the last year, the expert was created in June, I think the most profitable solution was for 30 m. It made some very good months out of sample. Then logically I refused to use it in the range of mid august. However the 30 m sstrategy did not recover as I expected from mid September. And then suprisingly in the beginning of October I found that that this works pretty good at 5m time frame. Well I did not take it seriously but when I run that yesterday I was amazed that this worked out pretty good. I just would like to mention that the idea of this expert was not really to trade directly. I wanted to know on historical basis if this stuff really works or it is just fancy dots on the screen. And yes thanks to the optimizer you can select the profitable settings. And find robust settings. And just one thing if the entry of the system is good the exits are not good. I mean the win/loss ration is pretty low. This is typical for trend following systems but I mean very often the position goes positive before loosing at the reversal. I mean with a discretionary trading you can make better. I mean opening two positions one to close according to the system the other to close discretionnary. The other important thing is that this expert moves in trends. It is either profitable or unprofitable. There is not a big loss coming arround. What is important here is that at all tested parameters it was profitable. The idea is when it is profitable it is a robust system. I tested the lenghgt from 20 to 150. 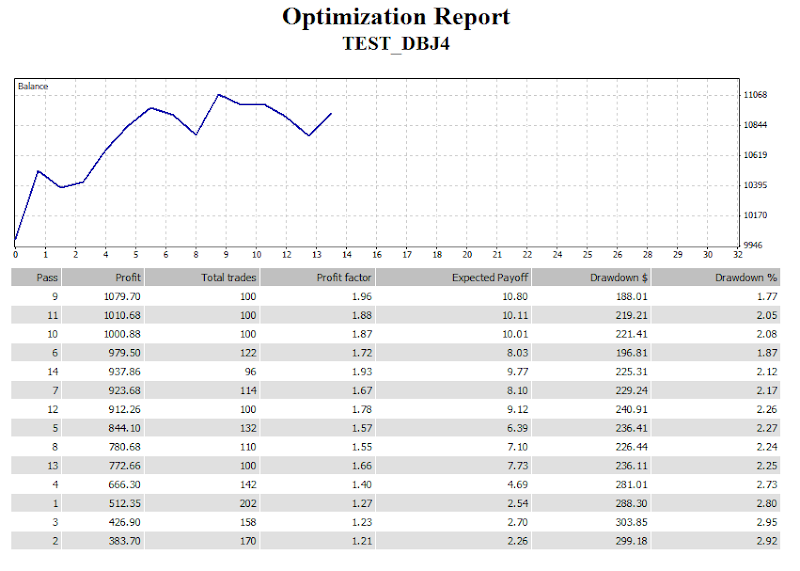 I used the normal optimizer as I tested only one parameter. The tests are from the beginning of this month 01.10.2011 the equity from the beginning of the post was from September. You can play with the settings of the expert too. If you find something interesting I will be glad if you share. Can you add partial take profit levels and a breakeven after say take profit 2 is achieved? I am testing it on range bars chart...will put up results here. The take profit levels are included in the expert but it somewhat against its logic, as the whole idea is to catch the big impulse. EU 5min - whilst things do work - recent chop can severely harm your account. That would make a completely different system with its own specificities. I am looking for the most simple set of rules. You need to carefully monitor those equity curve it is working or not. At the first sign of weakness the system has to reavaluated with the current market conditions.